We all know what the Las Vegas desert feels like during the summer months, and there’s no way we’d want to make things any hotter by turning on the oven. We’ve come up with a full list of recipes from tasty summer dinner ideas to easy snacks and divine desserts that won’t have your home overheating. While going out to eat in Vegas is always a treat, especially with the free air conditioning, sometimes staying in and making a meal is the way to go. Read on for delicious no-bake summer recipes to keep you and your kitchen cool in this Vegas heat! Just because this quick lunch recipe is so easy doesn’t mean it’s any less delicious. We all love hot tomato soup with an ooey-gooey grilled cheese, but maybe not when it’s 100+ degrees outside. Now, you can satisfy your summer lunch craving without breaking a sweat. This vegetarian-approved recipe heats things up in all the right ways. This summer recipe uses a little hot sauce while offering a refreshing mix of ingredients like avocados, cucumbers, and radishes to cool you down. Combine your mixture with a secret tangy ingredient and eat it between pitas for a near-gourmet sandwich right in your kitchen. Step up your usual tuna salad sandwich with this tasty twist. You can whip up this healthy and hearty meal with a tuna mixture, filled with Mediterranean flavors from ingredients like kalamata olives and feta cheese, all wrapped in lettuce. Not only will this recipe keep you cool while you’re making it, as it requires no heat whatsoever, but it’ll cool you down as you enjoy it as well. Make these crispy, crunchy, and delicious Mediterranean tuna lettuce wraps for your next lunch. This easy snack is great to give your kids on a hot summer day, but we bet you’ll be munching on it too. All you need is a Granny Smith apple, a little lunch meat, some cheddar cheese, and a little dijon mustard-greek yogurt mixture if you really want to step up your snack game. Pretty simple, right? And healthy too! You can have this crisp and cool no-bake snack ready in just a few minutes with no added heat necessary. Your guests will think you’re really something else when you whip out a hummus platter that is completely from scratch. What they don’t need to know is how easy making your own hummus can be, and we’ll keep that between us! Not only is mixing up canned chickpeas and a few other ingredients in your food processor simple, it’s also tastier and healthier than most of its store-bought counterparts. Don’t feel obligated to make your house any hotter than necessary this summer, and impress your friends with this delicious snack. If you have the perfect entree planned for your next dinner party but don’t know what to pair it with, impress your guests and start dinner off with this tasty, protein-packed white bean salad. The mixture of white beans, green beans, and zucchini is complemented perfectly by refreshing hints of lemon and basil. “Yum” is all we have to say about this no-bake summer recipe. This summer dinner idea is gluten-free and vegan – a prime example of the healthy and delicious recipes we’re seeing more and more of these days. 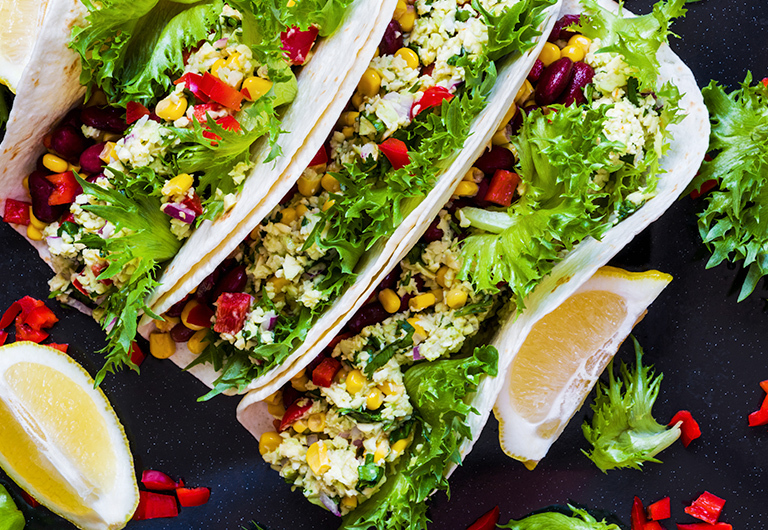 The sweet and spicy mango salsa pairs the perfect summer flavors with these black bean tacos. Here’s a fun no-bake summer recipe to take your barbecue to the next level. We didn’t know it was a thing either, but we’re loving these decadent hot dog toppings. No more settling for the ketchup and mustard duo. Who says you can’t enjoy a gourmet meal at your next barbecue? If you want a little spice, throw on some Sriracha with pickled veggies. Or, if you’re feeling a Mexican-cuisine-inspired dog, don’t be afraid to mix it up with a little guac, sour cream and hot sauce. As far as we’re concerned, the sky’s the limit when it comes to dressing your next hot dog. Smoked salmon paired with red onions and capers, lemon is a classic combination and never fails to tingle our taste buds. Pizza is usually a warm and gooey dish, but just because it’s hot outside doesn’t mean you can’t enjoy it. Freshen up the date night pizza you’re used to with this combo. And instead of baking pizza dough, simply build your pie on a precooked dough or even toasted bruschetta crackers for an easy summer dinner. This sweet and citrusy dessert is absolutely perfect for keeping you cool while satisfying your sweet cravings. Whip up this no-bake recipe that is sure to please and cool you down this summer. Making no-bake desserts does not have to sentence all the chocolate lovers out there to a fruit cup by any means. Don’t settle for unsatisfying substitutes. This peanut butter chocolate dessert that includes Oreos, peanut butter cups, and a whole lot more might even have you opting for no-bake recipes even when summer ends. There’s nothing better than a fruity popsicle to cool you down on a hot summer day. 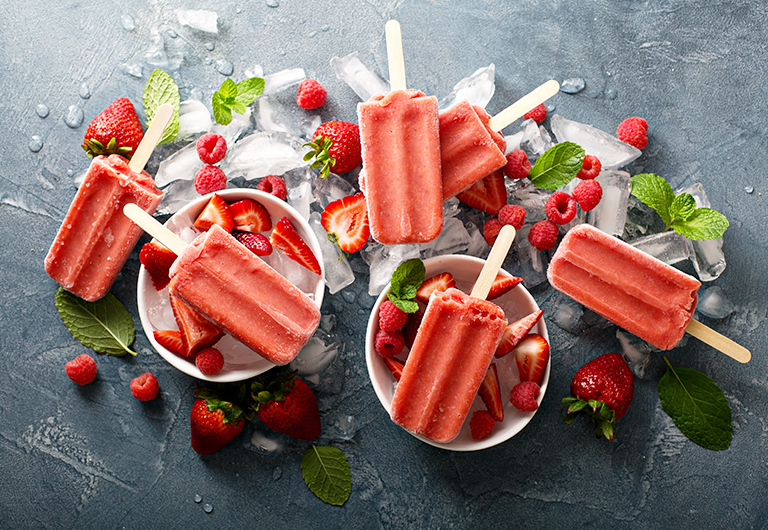 Take your popsicle experience past the usual ice cream truck options with these sweet and tangy strawberry-citrus freezer pops. Now you don’t need to go out to eat or break a sweat every time you’re in the mood for a tasty meal this summer. Check out our easy no-bake recipes for a refreshing boost!